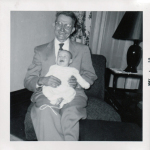 Posted in 52 Ancestors Challenge on May 18, 2014 by Amy Johnson Crow. Still trying to get caught up from being at the NGS conference. This recap covers Wednesday May 7 – Tuesday, May 13. Jackie Holloway has 3 ancestral birthdays on one day. Brian remembers his crabby Uncle Bill. 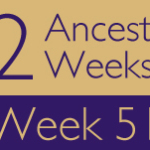 Also, last week must have been “Williams Family History Week.” Four different bloggers posted about a Williams ancestor! Beverly McGowan Norman of the “Roots, Branches, and a Few Nuts” blog recently lost her daughter-in-law, Deandra Stanley Norman, in a car accident. Her post this week is a beautiful tribute to her. Beverly, our thoughts and prayers go out to you and your family. My contribution for Week 19 was a very short post about my 4th-great-grandmother Mary (Darling) Young. DAVIS – “Leonard Davis and Mary Marshall” by Wendy on Jollett Etc. SNYDER – “Minnie Anflick, A Mother Worth Fighting For” (Minnie Snyder Anflick) by Tim Graham on Photo Restorations by Tim G.
name withheld – “My Mother Celia” by Tim Graham on Photo Restorations by Tim G.
Not sure how they got missed! Hi belleek! The Week 19 recap covers May 7-13; your Thomas Palmer post will be in the next recap. 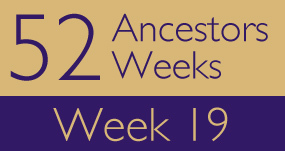 Emma Dorcas Palmer Cosgrove was in the Week 16 recap (under her maiden name of Palmer). 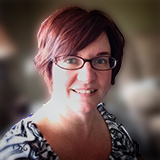 Thanks Amy, completely missed Week 16 … rushing around too much.